Lucy and Vivian are a pair of single parents living at Lucy's house. Lucy's daughter Chris goes out on a date with Alan Harper, a 16-year-old boy attending prep school. Chris feels her mother ruined the date by waiting up and running out to the car when the couple returned. Alan asks Chris for a second date and this time Lucy promises not to wait up for her. But after promising never to do it again, Lucy can't help herself and waits up for her daughter Chris to return home from the date. Not to embarasse her fourteen-year old girl again, Lucy gets herself into trouble. To not be discovered, Lucy accidentally locks herself out of the house and has to enter by the only means available; a trampoline. Special Notes: Lucy never memorized any of her lines on the show, and instead used cue cards. This is normally verboten by any actors, even sitcom or soap opera actors who have to learn their lines quickly. 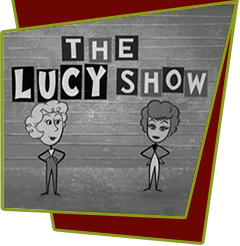 If you look close at The Lucy Show, you can see Lucy looking away from the actors in the scene to the cue cards, right before she says her lines. Reportedly, Lucy had no time to rehearse, because of her board meetings and other commitments as the head of Desilu Studios. Bloopers: When Viv pushes Lucy out of her bedroom window there is no artwork on the closet wall behind her. A few moments later, when Viv looks out to make sure Lucy has landed safely, there is a painting on the wall behind her.